WHOREDOM RIFE are a two piece band from Trondheim, Norway formed in 2014, and so far they’ve released one EP and full-length album. None of the members is associated with other acts and they both clearly like their Metal black and their names edgy. 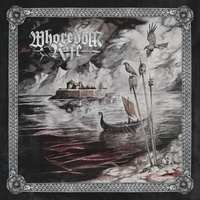 WHOREDOM RIFE play straight-forward, orthodox Black Metal, inspired most certainly by IMMORTAL, but they seem to like what I would describe the “witchy”, more melodic sound of Swedish bands like DARK FUNERAL. At least that would be my way of characterizing their sound that is so typically Black Metal to the point of being a bit nondescript. They nonetheless deliver a quite powerful album, in part due to their energy and attitude, in part due to their musical skills. There are seven song on this 50 minutes long album most of them clocking between the sixth and the seventh minute mark. It’s mostly straight-forward, no BS Black Metal: quick intro and then right to high intensity blasting and riffing. Compositionally all here is also kept simple: usually the song has a bridge after which the intensity of the song is stepped up a notch (like in the first song “Summoning the Ravens”) or more layers and atmosphere are added (like in “Verti Oydest”). Only the 10 minutes long closer “Ceremonial Incantation” has more development and some significant compositional shifts. Although the songwriting is kind of meat and potatoes, WHOREDOM RIFE make their songs more interesting with various buildups and lead guitar melodies. They don’t do anything that we haven’t heard before, but there is a certain conviction and finesse in the way they do it that compels one to take them seriously. I just love how convincingly evil the vocalist can sound, the drummer puts up a good performance and the riffs are excellent. The music can be monotonous and drag a little, but it’s Black Metal after all. In the right mindset you can immerse yourself in the atmosphere and let it bewitch you. It’s hard to pick a favorite song on the album, if I had to do so I would pick “Where the shadows dwell” because of it’s thick, despondent atmosphere. The production is great: it adds to the coldness and grandeur typical for Black Metal. All in all, it is clear that this band caters to fans of old-school Black Metal, so if you don’t have much passion for this style you will probably give this a pass. But I would certainly recommend it to someone who has a thing for early Black Metal.